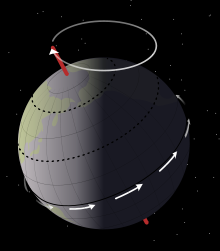 Earth's precession was historically called the precession of the equinoxes, because the equinoxes moved westward along the ecliptic relative to the fixed stars, opposite to the yearly motion of the Sun along the ecliptic. This term is still used in non-technical discussions, that is, when detailed mathematics are absent. Historically, the discovery of the precession of the equinoxes is usually attributed in the west to the Hellenistic-era (second-century BC) astronomer Hipparchus, although there are claims of its earlier discovery, such as in the Indian text, Vedanga Jyotisha, dating from 700 BC. With improvements in the ability to calculate the gravitational force between planets during the first half of the nineteenth century, it was recognized that the ecliptic itself moved slightly, which was named planetary precession, as early as 1863, while the dominant component was named lunisolar precession. Their combination was named general precession, instead of precession of the equinoxes.